Ahead of bringing his new tour show GETTING AWAY WITH MURDER to Scunthorpe Plowright Theatre Alfie talks to Andy Comfort at BBC Radio Humberside. In addition to talking about the show, and his twin careers as a police officer and comedian he shares some surprising information about himself – including his time as a pig farmer and his success as Elvis. Alfie also pays tribute to BBC Radio for giving him a ‘break’ after a comedy producer saw him performing his solo show at the Edinburgh Fringe Festival. The third series of his hit BBC Radio 4 comedy IT’S A FAIR COP is due to air from 31st May 2017. 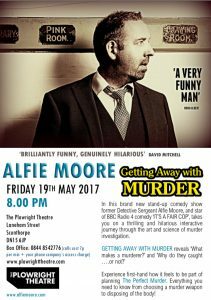 Alfie will be performing GETTING AWAY WITH MURDER at the Plowright Theatre at 8pm on Friday 19th May and tickets for the show at other theatres and arts centres are also available. « Who you gonna call?